Come and have fun with alphabet letter E preschool activities and crafts for toddlers, preschoolers and early elementary. Visit a theme below for lesson plans that include activities with easy instructions, printable crafts, printable materials in color and coloring pages, suggested children's literature and related early childhood resources. 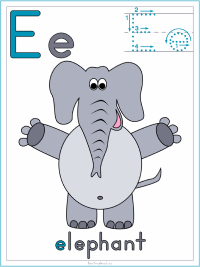 Letter E Printable Activities: color posters, coloring pages, activity worksheets, and handwriting worksheets in D'Nealian and standard block format.